Working under a tight 6-hour window for rebar installation, Hedrick uses the RT 100US crane to place rebar panels used for concrete reinforcement, each weighing up to 7,000 lb. Lattice boom crawler cranes typically steal the wind-turbine-installation show, and with good reason. Decked with their turbine packages, long booms and heavy counterweight, they are the most visible part of the operation, called on to lift turbine components weighing up to 300 tons (272 t). As with any show, however, much behind-the-scenes prep work must be completed in advance of wind turbine assembly, and this is left to rugged and versatile rough terrain cranes. Even though this work doesn't get the accolades — and is seldom noticed by the public — it must be completed quickly, efficiently and on time before the main lifting show can go on. The venue this time for IEA Constructors Inc., of Indianapolis, Ind., specialists in wind energy, is the 81-turbine Upstream Wind Energy Center north of Neligh, Neb. The 2.5 MW General Electric wind turbines will produce a total of 202.5 MW of energy, supplying power to the grid for households in Neligh and many of the surrounding communities. Before one rotation of the 186-ft. (56.7-m) long blades, ground preparation, concrete and steel pedestal work must be completed. 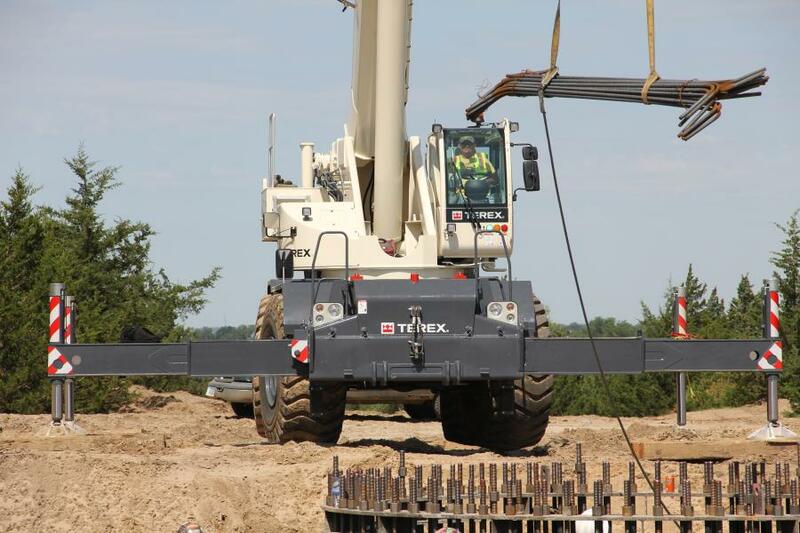 For Roger Galloway, crane assembly/disassembly director, and Mike Hedrick, crane operator of IEA, this means non-stop work with their rough terrain cranes, placing rebar and steel cages in preparation for concrete pours. Their work serves as the turbine's foundation, securing these massive structures to the earth and withstanding considerable forces generated by the wind and turning blades. Significant planning and orchestration of moving parts are required to properly construct the turbine's base. IEA starts by excavating a base area roughly 90 ft. (27.4 m) in diameter, and the ground where the crane is working must be stabilized to handle the weight of the crane and its load. “The RT 100US crane has a small footprint, which means less ground prep work and less money spent on site preparation,” said Galloway. The primary reinforcing base component consists of a 13,000-lb. bolt cage, positioned at the center of the rebar and filled with concrete. While the controls allow Hedrick to quickly place the panels, the RT 100US's newly integrated Demag IC-1 control system also gives him the ability to close the valve and dial-down swing function speed for more precise placement of the heavy bolt cage. According to Hedrick, the new control system helped him to quickly learn crane operation. Hedrick positioned the 13,000-lb. cage using 104 ft. (31.7 m) of main boom at a 72-ft. (21.9-m) radius. “We tried using a 130-US-ton capacity class crane to position the cage, but the RT 100US proved to be a better choice,” said Galloway. After positioning all the pedestal steel, IEA's crane operators move to another tower location to repeat the process. The company has four rough terrain cranes and operators on site for base construction and typically divides duties between rebar placement and finish work once the concrete has cured. Sometimes, however, a dedicated rebar crane receives a call-back to finish off a tower base. This can mean driving long distances to get back to a different tower. “There is no wasted weight with the new RT100US crane design, and it roads very well fully rigged from one site to the next,” said Galloway. Within 10 minutes of reaching a tower site, it's ready to get back to work. According to Hedrick, he has drove the crane several miles to get back to a tower base for finishing. On a site like this with multiple operators, each may be asked to run the RT 100US at different times. The new IC-1 control system offers one additional feature that helps to save time for IEA operators. “The control system allows up to three different operator profiles to be preset, so preferences are quickly restored,” said Meier. With the many design improvements built into the new RT 100US, the crane has proven its worth to Hedrick on the Upstream Wind Energy Center. “This one is a solid crane that offers a great load chart at extended boom length and radius,” he said. IEA is an infrastructure construction company with specialized energy and heavy civil expertise. IEA takes a partnership approach to every project, proactively sharing expertise, foreseeing potential roadblocks and driving innovation. For more information on IEA Constructors, visit https://iea.net/.